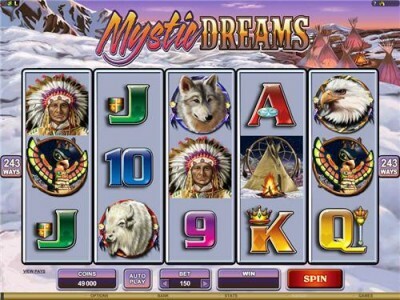 If you love the Australian Indian Dreaming pokie from aristocrat, then you are going to love Mystic Dreams, the online equivalent. This is a 5 reel Native American online pokie which can be played free as a demo or with real money at online casinos. There are 243 Ways to Win which enables big payouts and rewarding returns. Symbols include totem poles, Indian Chiefs, Tents, eagles and wild wolves. The Mystic Dreams Logo symbol which functions as the game’s Wild symbol. The Totem symbol is acts as the Scatter so look out for three or more which activates the Free Spins Bonus game. The number of Scatters which land on the reels determine the number of free spins rewarded and during the free spins bonus the Mystic Dreams logo provides big multiplier opportunities. The maximum number of free spins is 20. Even better the free spins bonus can be re triggered with more totem poles. If you like native American themed online slots then this is the game for you. Enjoy the demo game or play with real money at our range of online casinos.